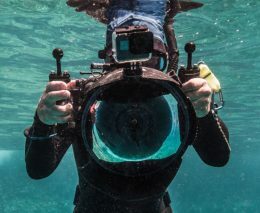 The Maldives’ LUX* Resort South Ari Atoll recently celebrated its rather special underwater world with the first ever Maldives Underwater Festival, a celebration of the region’s marine life and conservation efforts. 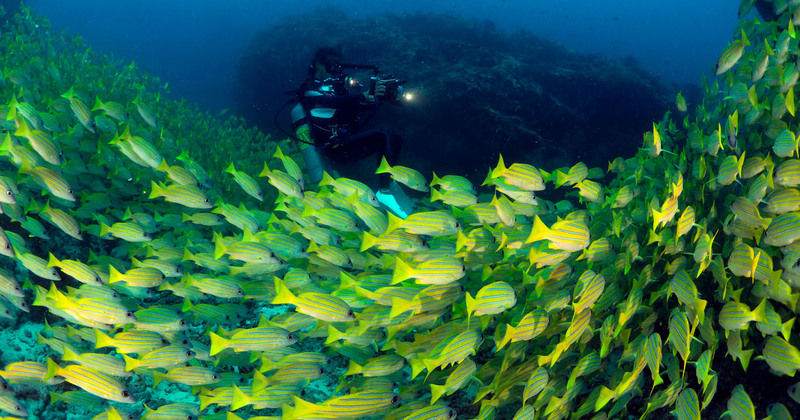 The Festival is a fantastic line up of diving, marine encounters, workshops, seminars and a whole heap of fun – in a luxury resort in The Maldives. Could it get any better than this? Wait till you read about the line-up. On our first day, we meet the resident marine biologist, who gives us a briefing on the types of coral we’re likely to see while diving, as well as an explanation of the threats. No surprises there: climate change. 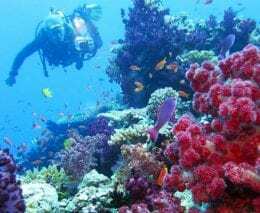 The Maldives suffered a bleaching event a couple of years ago which has done some serious damage to Maldivian coral reefs. The marine life however, appears to be thriving. Fishing nets are not allowed in Maldivian waters at all – all fish caught for consumption is line-caught. And several areas within the archipelago are designated no-take zones – including the place we are diving today: Kuda Rah Thila. 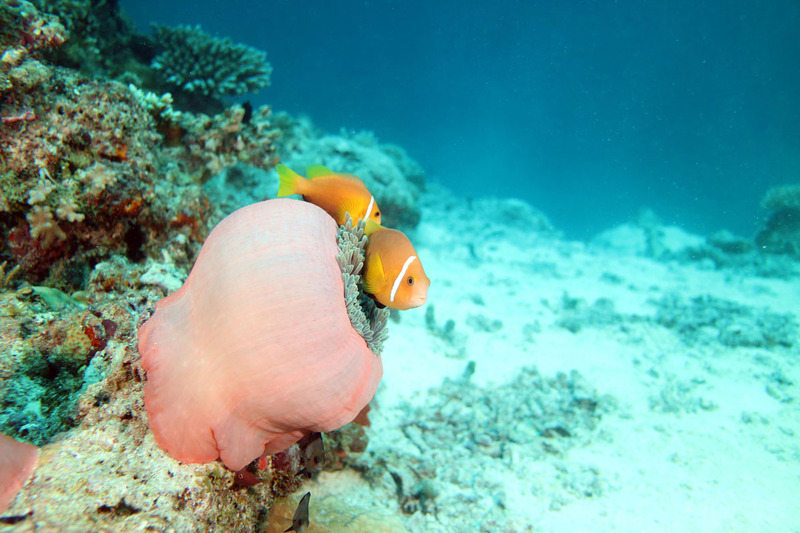 The Maldivian blackfooted anemone fish. 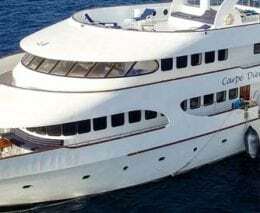 Endemic to the Maldives and Sri Lanka. 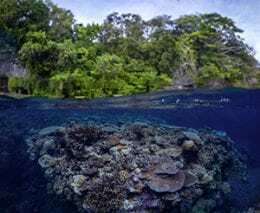 It’s a large coral bommie, with enormous sea fans around the base, abundant soft corals decorating the overhangs and a dip in the middle that plays host about a billion blue stripe snapper – a photographer’s dream come true. Local artist Hussain Ihfal presents his artwork painted underwater. 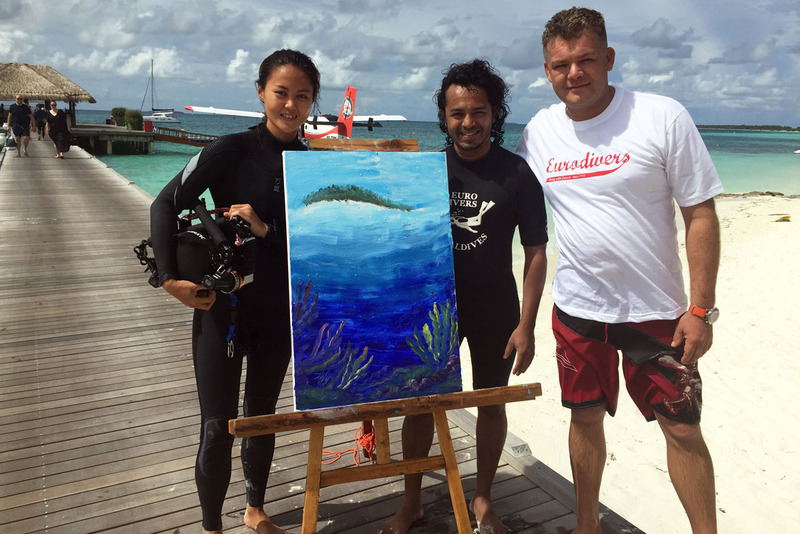 Back at the resort, a local artist is celebrating the underwater world in a rather unique way, painting canvas (in oils) underwater. The painting, purchased by PADI, will be auctioned at DEMA, with proceeds going to Project Aware. In the evening Dr Drew Richardson, President and CEO of PADI Worldwide and Founder of Project Aware, presents the PADI story – its history and a new direction, from shift in focus from teaching people to dive responsibly and safely, to teaching awareness of ocean conservation issues, using its underwater army of 25 million divers to fight for marine conservation. 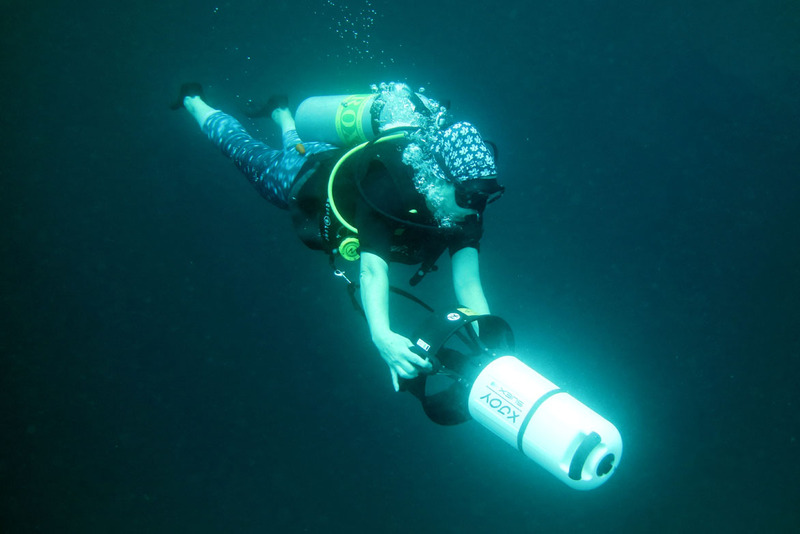 On our next underwater excursion, we get to play with some serious toys. First up, iBubble, an innovative new underwater drone. 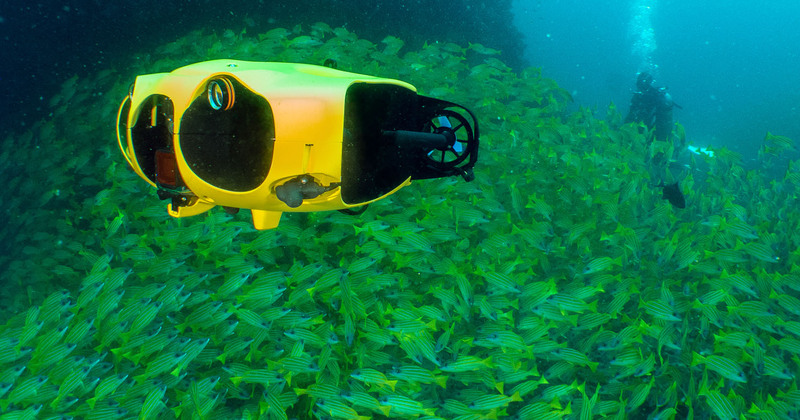 Using cutting-edge technology, this bright yellow drone can follow hand-signal instructions to shoot whatever you want it to – or simply follow you around and film your dive, leaving you to simply enjoy it. Underwater drone iBubble follows us and records our dive for us. Photo: Sandrine Leveugle-Souan, editor, Plongez! We’re also given an opportunity to dive with an underwater scooter, with PADI on hand to take us through a Diver Propulsion Vehicle specialty certification. The scooters are easy to handle, and I imagine quite useful in current. We use them to fly around a wreck inside the lagoon, and do a few loop-the-loops. Learning how to operate a Driver Propulsion Vehicle. LUX* South Ari Atoll is located in a rather special part of the Maldives. 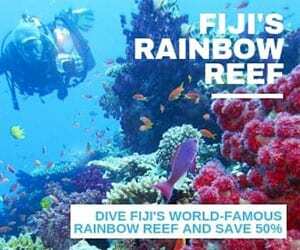 Its back reef, which drops off a few hundred metres out from a row of luxury over-water bungalows, plays permanent residence to a large population of whale sharks. 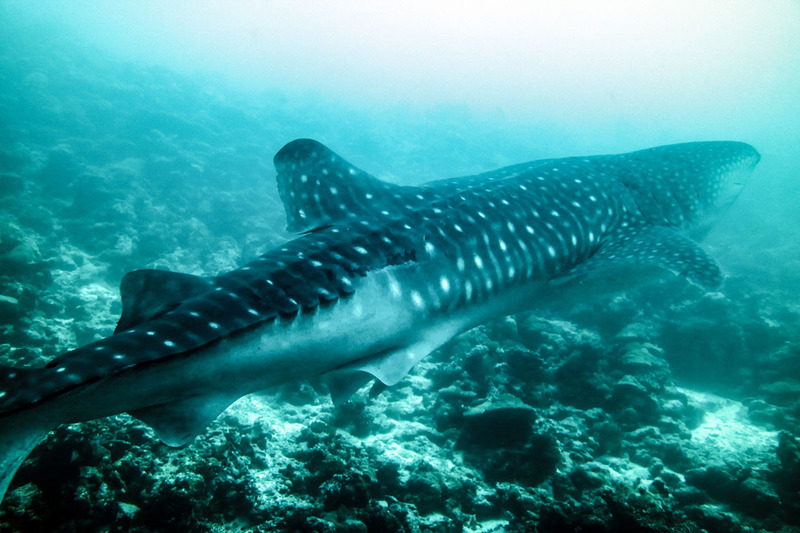 The Maldives Whale Shark Research Program (MWSRP), located on nearby Dhigurah Island has identified 388 individuals, so chances of a whale shark encounter here are fairly high. In fact, the dive shop manager tells us we’d have to be “pretty unlucky” not to see one at least once during the week (famous last words). Before our dive, we’re briefed on whale shark etiquette, the proximity allowed by swimmers, divers and boats, what to do, and more importantly, what NOT to do. Our first encounter is on snorkel. After patrolling the reef wall for a while, a whale shark is spotted and we all go crazy, grabbing masks, fins, cameras, before jumping in to join the melee. As soon as my head’s underwater I spot him. Somehow, I’m lucky enough to land in the water right beside him. And he’s moving very slowly. It’s not too hard to swim alongside, make eye contact and just watch this gorgeous giant as he glides through the water. An incredible thrill. I find out later his name is Jonah. The Maldives Whale Shark Research Program identified this whale shark as Jonah. My next encounter is on scuba. As we swim along the reef wall, our guide is on whale shark watch and we’re not in the water long before we hear our guide banging her tank, alerting us to an approaching whale shark. Again, he glides gracefully by, slowly enough for us to swim alongside and take a few photos before he disappears into the blue. He has a few tell-tale scars on his back which make him easy to identify: Naococco. Naococco, still showing scars from a boat strike incident in 2015. 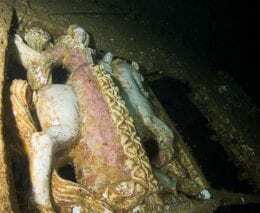 Naococco made headlines a few years back, sustaining the worst boat-strike injuries researchers at the MWSRP had ever seen and three years on, the scars are still visible. In the evening, we’re treated to a presentation by the MWSRP Infield Coordinator; Abdul Basith Mohamed, who shares some insights into what little we know about whale sharks (more on this in an upcoming article). 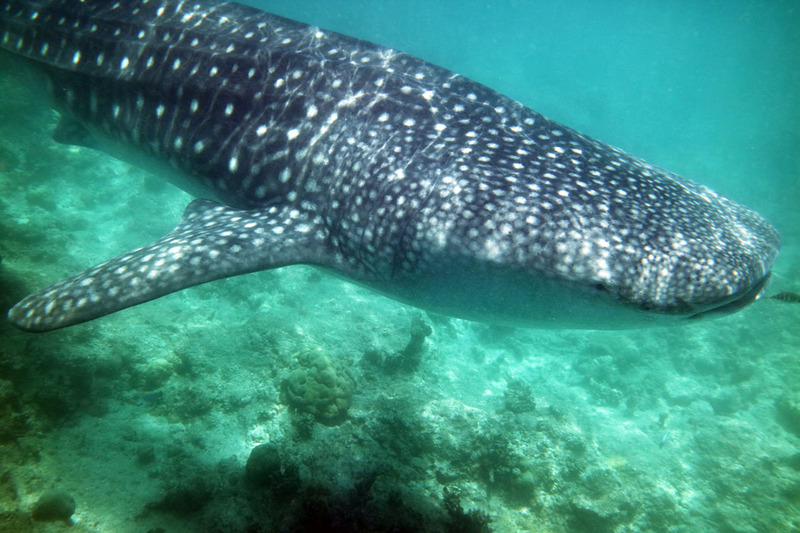 We know very little about whale sharks – but the MWSRP has established that this site is a secondary nursery, and the statistics they gather highlight the site’s importance as a tourism attraction and help convince government to maintain its protection. Anyone can contribute to the MWSRP research by sharing photos with the team via their mobile App. The whale shark you encounter will be identified, and if they can’t find a match – you get to name it! From one endangered species to another, the next day we find out about the Maldives’ sea turtles, and specifically, the plight of the Olive Ridley, from turtle vet Clare Petros. 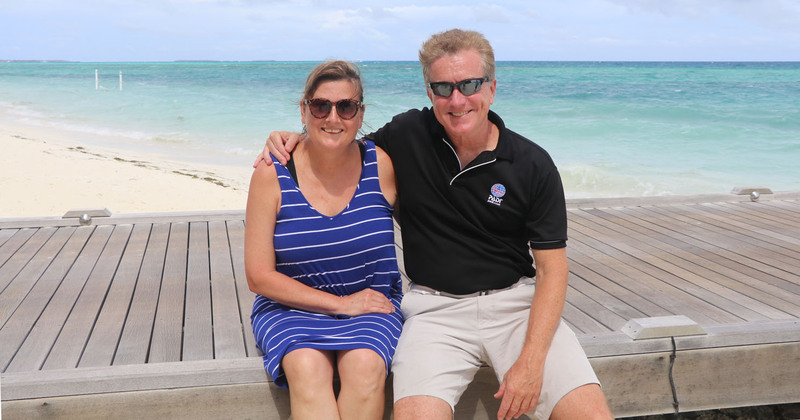 Clare manages the Olive Ridley Project (ORP), and its Marine Turtle Rescue Centre in Coco Palm Dhuni Kolhu Resort in Baa Atoll. Olive Ridley Project’s Dr Claire Petros enroute to the Marine Turtle Rescue Center with a patient. Being pelagic creatures, Olive Ridley turtles the most susceptible to ghost net entanglement. They are rarely found nesting in the Maldives, yet they are the turtle species most frequently found entangled in ghost gear. Between 2011 and 2018 the ORP recorded 528 entangled Olive Ridley turtles, 87.9% of all entangled turtles reported. The Centre provides veterinary care and rehabilitation to injured sea turtles rescued across the Maldives. Other programs managed by ORP include the removal of ghost gear from the ocean, education and outreach programs, sea turtle monitoring, they’re even looking at ways to re-use or re-purpose ghost nets. 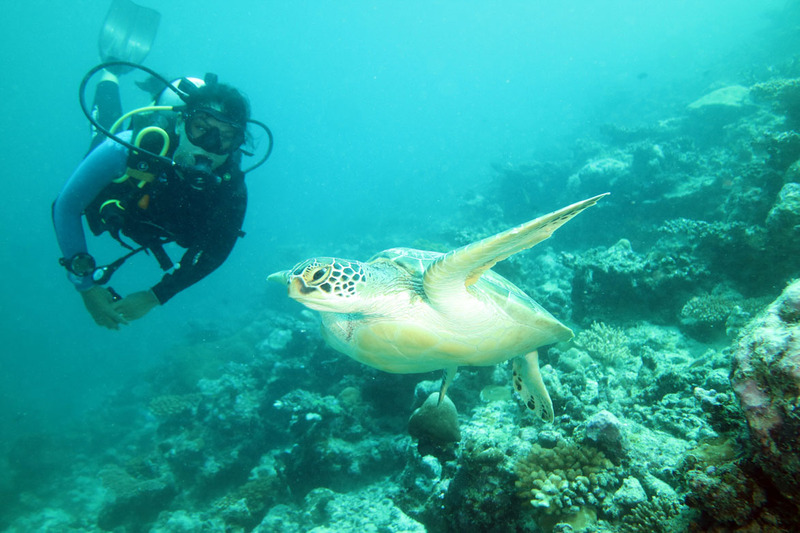 A green turtle encountered on the House Reef. We join Clare for a dive after this presentation and are joined along the way by three turtles, two green turtles and a little hawksbill who ignores us completely as he nibbles at sponges on the reef. It’s been an inspiring week, celebrating the underwater world in so many different ways, from underwater painting to marine conservation and new technology. I’ve learnt more about whale sharks in a week than I knew in my lifetime beforehand and come face to face with two of these gorgeous gentle giants in as many days. 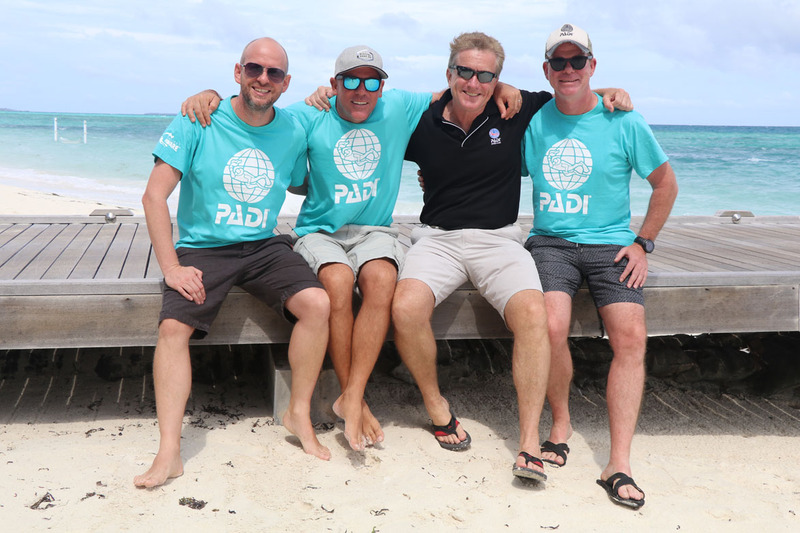 The PADI boys: Richard Somerset, Matt Wenger, Dr Drew Richardson and Mark Spiers. Our week ends with a beach-side barbeque, watching images and video of our underwater adventures projected on a giant outdoor screen. And what a week it was. We all emerge invigorated and inspired. Invigorated by incredible marine encounters, and inspired by the presentations given each day by passionate ocean advocates. 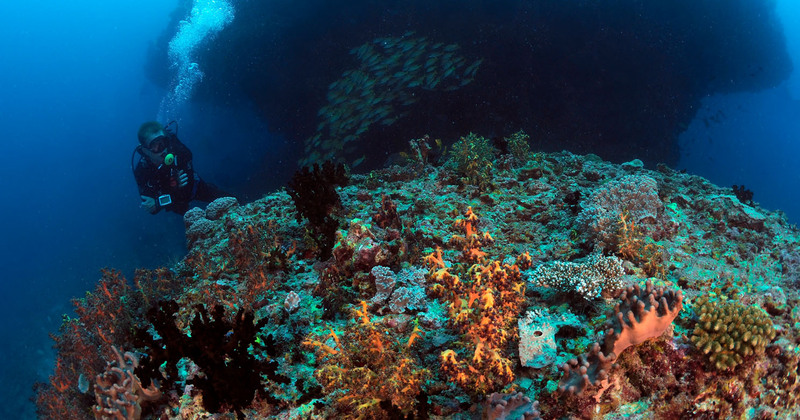 We dived with: Euro Divers Maldives at LUX* South Ari Atoll, Maldives. Contact us for information about dive/stay holiday packages at LUX* South Ari Atoll. Me and my esteemed dive buddy, Dr Drew Richardson, CEO and President, PADI Dive Worldwide and Founder of Project Aware.